I just realised when looking at some of my recent paintings that there seems to be an inclination to be inspired by vertical motifs, so I have included a few here. 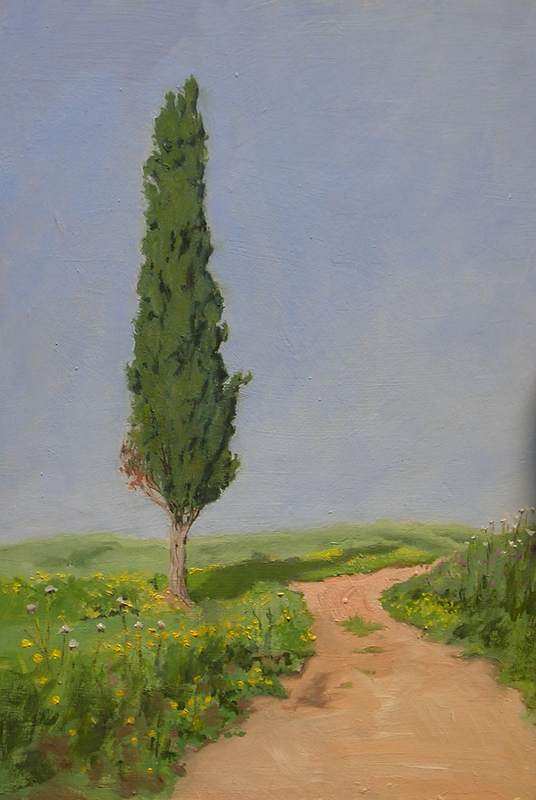 The cypress tree was in a field near my home, and I liked its loneliness in the landscape. It is just a simple tree, and one you could probably find anywhere, yet it called out to me to paint it. I suppose I prefer a single tree over clusters, as it gives importance to the tree, as if it were a person standing there, day after day, under the sun. After about a half hour, some Bedouins came by with a flock of goats and sheep to look on, and I was happy to hear their compliments. I went to visit their farm the next day. This next view is in the bedroom, an indoor tree, and I liked coming across it because of the water bottle and one of my prized possessions: the catalogue from the Antonio Lopez Garcia exhibition that I saw two summers ago in Boston. I hope one day to afford to get my hand on one of the major catalogues of his work. 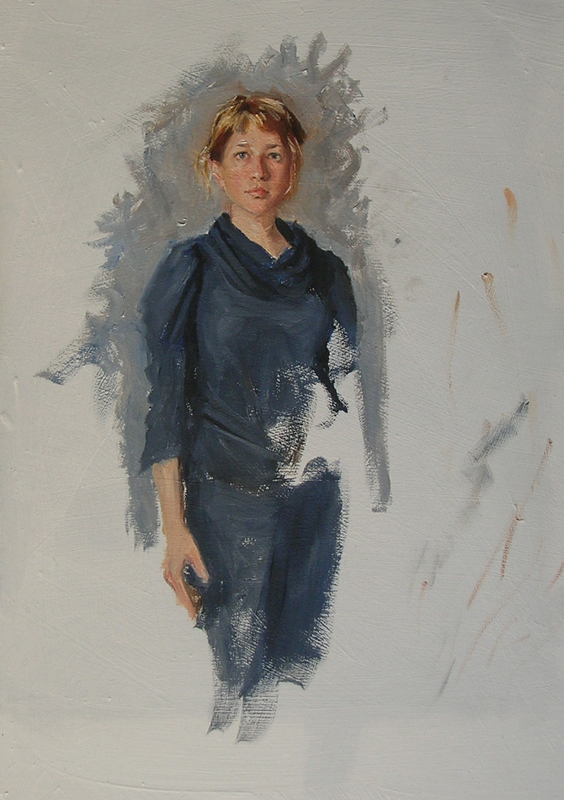 The third painting is a start of a mini, flat light self-portrait. I find the challenge of going smaller and still trying to get forms and shapes right a good one. 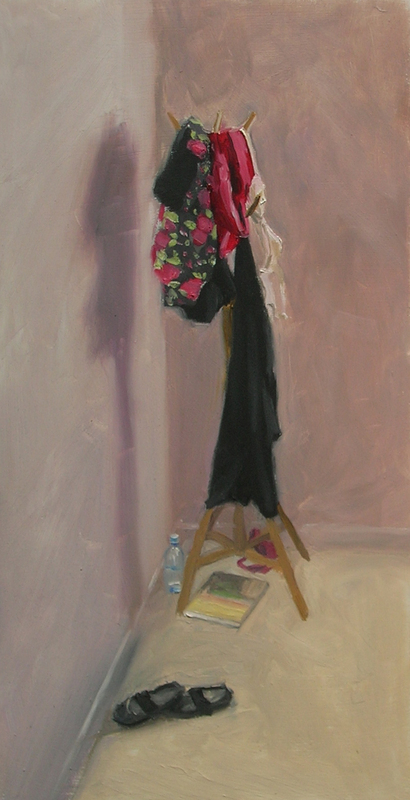 It is not finished yet in my opinion, but I have also received advice that I should leave it as is. I am not so sure, but I will share the start in case I move forward with it and hopefully not regret it! Today my roll of heat-activated adhesive arrived from Talas in the States, which means I will soon be able to move back to linen and larger sizes. The adhesive will allow me to safely and temporarily attach linen to supports, and this means I will be able to safely remove them for future travel purposes, a great relief when I think about the bulk of panels I have already covered in just a year.